This pair, the “Garland & Snowflakes” design, is a woman’s medium or man’s small. Size washed and blocked: width 3 3/4”, total length to bottom of fingers 6 1/4”, cuff length 2 3/4”. PDF Pattern has 4 StitchMastery charts, detailed instructions and very helpful techniques to make these super comfortable, formfitting gloves. Motifs are adapted from authentic Norwegian museum pieces. This is a circular color work knitting pattern using 4 and 5 needles. Very clear detailed photos are also included. 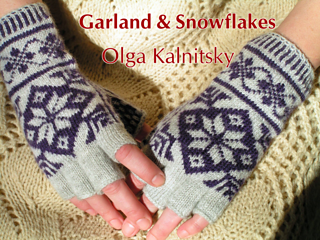 Olga’s half-finger design for these pairs is more practical and comfortable than fingerless styles: it’s warmer and fits snugly on your hand while allowing complete finger dexterity It has longer cuffs for less wind chill and more pattern beauty. Here are two comments from buyers of this Half-Fingered style: “Gloves are beautiful, soft and cozy! I like the style of half finger instead of fingerless because it is so much warmer”, “…so beautiful, highly recommended, perfectly hand crafted”. The careful instructions as well as the Tips & Techniques section of the four page PDF share methods that were improved, discovered and worked out while knitting over a dozen pairs and help with: tension and size continuity; evenness of stitches; avoiding the gap or hole that often appears in the corners of the thumb on hand knitted gloves; snug shaping of the spaces between the fingers; finishing the open edges of the fingers securely and seamlessly; etc. Also included is a very successful method for the washing and blocking of hand knitted gloves to finish these pairs. You will receive your Kites & Snowflakes knitting pattern in PDF form via Email within 24 hours of your purchase! We are fascinated by the whole process of the ancient craft of Knitting. We long for each piece we present to add a spark to the creativity and exploration of this art.